Dorm Rugs - Which Size Do I Need? Choosing your college dorm rug depends on how much of the room you want it to cover. Do you want a rug just in front of your bed? Or do you want a rug to cover almost your entire floor? Do you want the cheapest dorm rug just to keep the nasty floor covered? 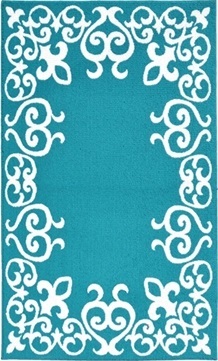 Or do you want a rug that adds sophisticated décor to make your room unique? The most popular size for college dorm rugs is 5’ x 8’. Close behind 5’x 8’ in popularity is 4’ x 6’ and 6’ x 9’. The reason 5’ x 8’ dorm rugs are the most popular is that they cover up the majority of your open floor space. Although 5’ x 8’ won’t cover your entire room or under your bed, it will cover open space while leaving enough room for your college furniture and other dorm supplies. Where you may walk, sit or even lie on the floor, the 5’ x 8’ size has you covered. With a 5’ x 8’ the overall cost of the rug is affordable, although other factors like design and material can influence the price. 4’ x 6’ is the second most popular dorm rug size. The reason is that the 4' x 6' size for many dorm rooms fits square the middle of your room's open space. The size also fits perfectly next to dorm beds, especially bunk beds. If your bed is not bunked, the 4’ x 6’ dorm rug can be positioned next to your bed and can cover your personal space. It’s a versatile size and can make for great dorm décor. Although 6’ x 9’ doesn’t cover your entire floor, it is as close as you’ll get without hiring a local carpet layer (which we don't recommend you do!). This size gives your room coverage under your bed and across your entire room. Still, some opt for a smaller rug for college since you don’t need a nice dorm rug under your bed collecting dust bunnies! You’ll also find 3’ x 5’ rugs while on your dorm shopping journey. 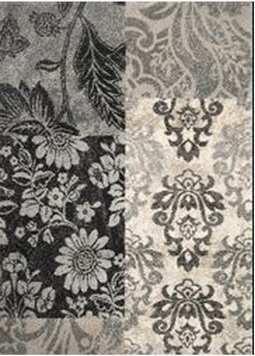 These rugs are typically bedside rugs only and provide a limited amount of coverage. 3' x 5' is a great size for giving your feet something comfortable and soft to step on next to you bed each morning. Plus, if you're not sure your roommate will like the dorm rug you select, choose something smaller and keep it to your side of the room. The above sizes are the most common sizes for dorm rooms. However, you will find some variants out there. Still, with these sizes as your base for measurement, you'll be able to figure out what size will suit your dorm room best. Remember, no matter how small or large a college rug is, it will round out and contribute to your overall college decor. Dorm rugs are some of the best —if too-often overlooked! —college decor items!